Denise Resnik has had a truly remarkable entrepreneurial background and has been in business as a marketing communications consultant for 30 years. Her projects include the Southwest Autism Research and Resource Center (SARRC), First Place AZ, DRA Collective, and, most importantly for today’s conversation, the remarkable SMILE Biscotti. Denise is also the proud mother of a young man with autism, Matt, who was diagnosed at age 2. She was told to love, accept, and eventually institutionalize her son, which she found unacceptable. Instead of following that path, Denise used Matt as her source of inspiration, and together they created SMILE Biscotti. Ever since, they’ve been working to find a better way for Matt and others like him. Originally, SMILE stood for “Supporting Matt’s Independent Living Enterprise.” As the company grew, though, it evolved; the name now stands for “Supporting My Independent Living Enterprise.” The company’s true goal and mission is to help other families build employment opportunities and a sense of community for those with autism. The company’s very first order was for 1,500 biscotti for a special event in late 2013. Now, it’s extremely successful. SMILE has sold over 160,000 biscotti, and the product is a top seller at a local branch of a major coffee chain. In our conversation today, Denise emphasizes the fact that the work isn’t just about making, packaging, and selling biscotti, but also about truly creating a community. The employees experience this community when they shop for ingredients from people who know about the company, when they make deliveries to devoted repeat customers, and even when they go to the bank. Tune in to learn about all of this and much more, and maybe to get the inspiration and knowledge you need to take the next steps with your own autism-supporting venture! [01:27] – What inspired Denise to start on this journey, and what continues to motivate her? [02:02] – We learn more about why Denise and her husband, Rob, founded SMILE Biscotti and how their goals have evolved. [03:39] – SMILE Biscotti started with Denise’s grandmother’s recipe. They experimented with it and found that they were able to create a twice-baked product with a long shelf life. [04:56] – Tom steps in to clarify for listeners that Denise essentially took an existing skill and pre-sold it, rather than raising capital first. Denise then brings up a few other points, and emphasizes that it has been a feel-good business rather than a feel-sorry-for message. [06:42] – What did Denise learn from the feedback from early taste testers of the product? This process, she explains, is how they settled on their four flavors: Cinnamon Vanilla, Mocha Magic, Double Chocolate Chip, and Butterscotch Bliss. [07:37] – Denise raves about how great it’s been to start a family business with children, parents, aunts, and uncles all involved in different ways. [09:44] – There’s a misconception that entrepreneurship is about you against the world, and a sense of rugged individualism. Tom points out that this is completely wrong, and it’s all about mentors and community. [11:18] – Denise expands on Tom’s point about supporting each other, discussing how Matt and his coworkers support each other and create efficiency. [12:52] – How has building this business affected Matt? Denise lists some of the incredible benefits that Matt has seen from the project. [14:28] – Matt and Denise have been baking together for most of his life, so he already had a lot of experience before the business opened. [15:54] – Denise discusses how the project has impacted her perception of how capable people with autism are. 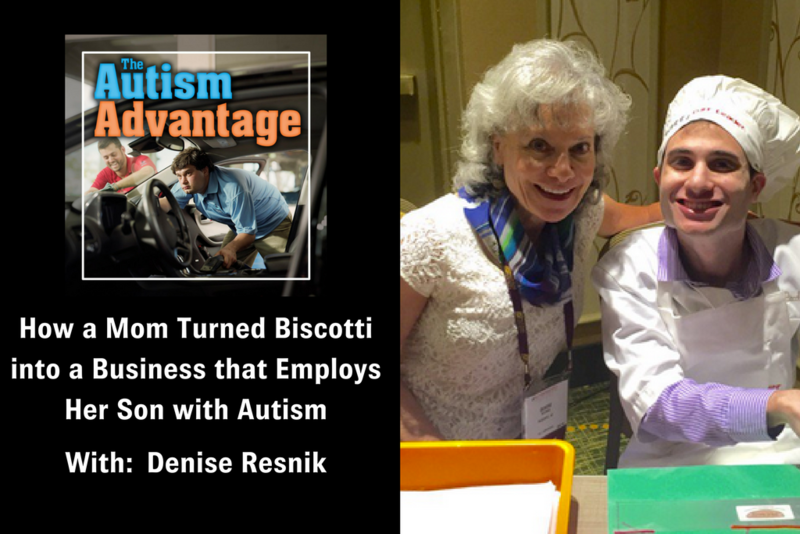 She also explains how successful their biscotti has been locally, and touches on the role of autism in their marketing and messaging. [18:19] – Denise goes into more depth about the way that the packaging talks about autism. [19:37] – What does Denise feel the business implications are that she’s learned from building SMILE? [20:42] – Tom points out that the messaging is able to talk about how the person is able to realize their own goals, and SMILE is helping them get there. He then points out that at Rising Tide Car Wash, they have the huge advantage of not needing to pay for advertising. [22:58] – Denise has been seeing that advantage as well, and mentions the loyalty that they see from their repeat customers. [24:33] – What’s Denise’s vision for the future of SMILE? In her answer, she talks about her perspective on growing the company.